Telehandler Certification Calgary - A telehandler certification course can be taken by potential operators who have past experience with driving standard forklifts and for individuals with no past experiences on a lift truck. 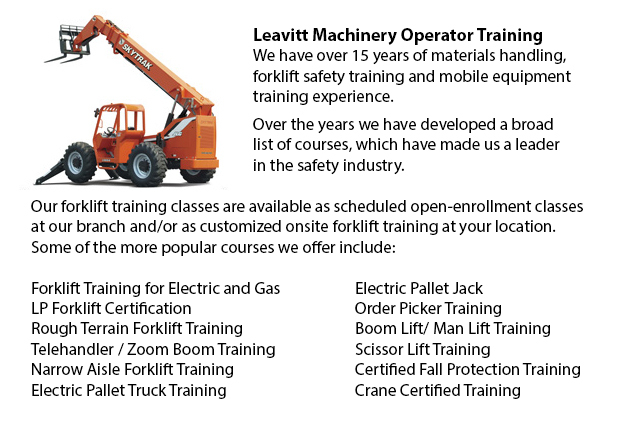 The real-world training offered by these programs produces graduates who know the safe and proper use of these types of machines. Telehandler certification programs could be finished at a third party location or at the work site of the trainees. To be able to get the formal training at a specific training facility, the manufacturer could work out a licensing agreement to bring other individuals to a training facility. This option offers those training with the opportunity to learn to utilize the machines in a controlled setting. When finished, participants receive a license or certification to use this type of machinery. When the training is carried out on the worksite, a skilled instructor is sent to the work site. This is the best way to make sure that your personnel receive specific training on the machines that they will be working with, helping to train the trainee in their own work setting. People training learn about potentially dangerous situations that could take place on the actual work place. The instruction focuses on any conditions which are specific to the work site, enabling operators to be prepared to safely handle these elements. The term "telehandler" is an abbreviated version of "telescopic handler," referring to a machine which has a telescoping or extending arm supporting a fork. A telehandler has different controls and characteristics similar to a forklift. A telehandler has the capability of lifting and transporting loads up and away from the vehicle. Wrong use of telehandlers could cause serious accidents. If load limits are exceeded, the machine can tip due to excess weight on the lift. It is an operator's duty to know load limitations and to use these machinery safely. Telehandler programs designed for operators who are already certified to make use of a forklift are referred to as "conversion" classes. These classes teach the differences between forklifts and telehandlers, and avoid repeating information which forklift operators already know. For trainees who have no prior experience making use of telehandler equipment, training includes the basic operation and utilization of the machine. Some organizations likewise offer refresher programs.